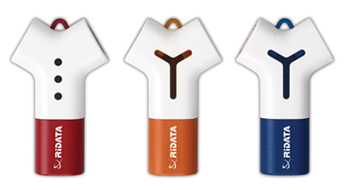 RIDATA USB drive -Y designs includes two additional USB ports, which allow users to combine each USB drive into a USB HUB and add on more mobile devices. To assure privacy and protection, the USB Flash Drives feature advanced partition and security functions that make it possible for users to create password-protected sectors for the storage of personal or highly confidential material. A tie-style LED indicator shows usage status, assuring there is never any doubt as to which port is currently in use. * True Plug & Play connecting to USB. * Power Supply: Powered via USB port. No external power or battery needed. * Power save: Support power saving mode to reduce power consumption? * LED indicator: LED indicates usage status. ?Desktop or notebook computer with USB port. ?Support Driver-free for Windows ME, 2000, XP, and above. ?Support Driver for Windows 98SE. ?Support Linux Kernel version 2.4 or later version?